What happens in the moment you discovered your numbers matched a major prize! What do you do next? Winners often go into shock. Then they go into screaming, dancing, cheering, crying mode. Some go numb. But what happens to the ticket during these moments? Just think... you're holding a small piece of paper that represents a new life - a future that is so different to anything you've ever experienced, giving you the freedom to do whatever you want. A reward that fixes all your problems... helps all your friends and family... forever. Here’s what happens when you iron your ticket. It could be destroyed forever! What would you do - at this very moment - with this small piece of paper you are holding in your hands? What happens if you put it through a scanner to copy it, and it got ripped apart by the rubber wheels? Or if you put it into a photocopier that jammed? Or if you put it into your shirt pocket and ran excitedly through the rain to tell your friends, only to discover that all the writing had smudged? Or waved it in the air - only to have it snatched from your fingers by a low-flying seagull? Crazy thoughts! But what would you do? How would you keep your ticket secure until you collected your winning check? 1. Sign it with your name and address immediately. 2. 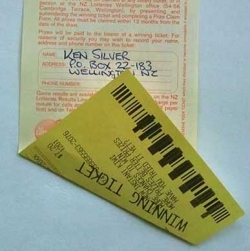 Take a photo of both sides of the ticket. 3. Put the ticket in a sealed plastic bag. 4. Keep it on you. Some winners tape the ticket to their body. 5. Tell no-one. The fewer people who know, the better. The next list you need to make is a shopping one!